Hello! It is starting to get a little cooler and I am getting excited about fall. One of the big fall signs in my area is apple picking and sending the kids back to school. My card today is simple but makes me think of both those things. 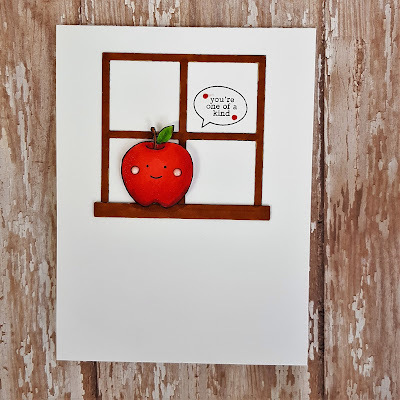 I started this one by die cutting the window out of kraft paper and stamping and coloring the apple with copics. 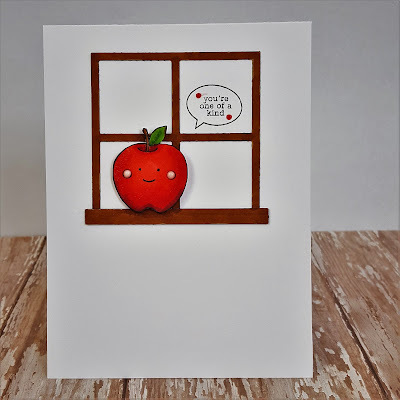 I attached the window frame to a top folding A2 white card and then fussy cut the apple out and added it to the front with some foam tape. After I stuck the apple on, I decided I didn't like the color the window frame so I used my copics to color it a darker shade of brown. Then I stamped the speech bubble and the sentiment. I added some white nuvo drops to the cheeks of my apple and some red ones in the speech bubble to add some color. Ok, I am off to take my son to the dentist :) To everyone in the south/southeast US, please stay safe and we are all praying for you! Cheryl, I agree with you...fall is quickly arriving and it does make me think of apples! 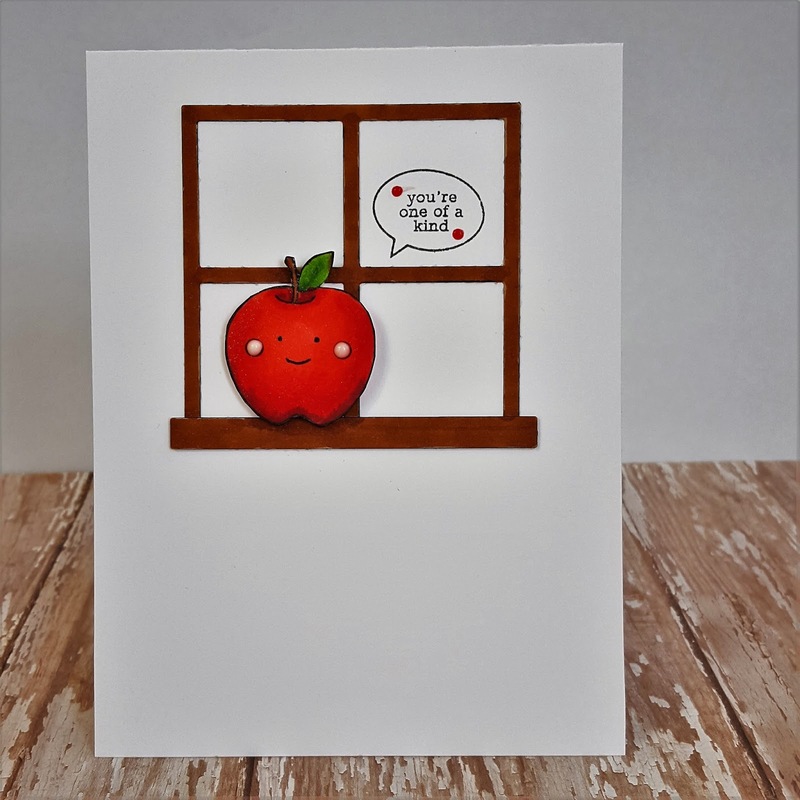 I love your die-cut window and the sweet smiley face on that apple! Thanks for joining us at CASology! I grew up near an orchard when I was a kid, so I always think of apples when it's fall, too! This card is super sweet and I love the little details you added with the Nuvo drops! Thanks for playing along with CASology! Apples and school will always mean fall for me! Thanks for joining us at CASology this week, Cheryl! Absolutely love your sweet and simple card. Your apple is adorable. So glad you joined us at CASology this week. Hey Cherly!! Your card is so stinking cute!! I love that delicious red apple. Your card makes me smile. Thank you so much for playing along with the CASology Challenge this week. This is adorable and I love how you've framed the little apple with the window! Fabulous CAS card Cheryl! That little apple is so cute. This is so cute, Cheryl. I can't wait until the new crop of apples are in the store. Thanks for sharing your card with us at Addicted to CAS.